Lawrence Livermore National Laboratory (LLNL) in the US says that its researchers have become the first to 3D print aerospace-grade carbon fiber composites. The research, published by the journal Scientific Reports, represents a ‘significant advance’ in the development of micro-extrusion 3D printing techniques for carbon fiber, the authors reported. LLNL researchers reported printing several complex 3D structures through a modified Direct Ink Writing (DIW) 3D printing process. Lewicki and his team also developed and patented a new chemistry that could cure the material more quickly. Computational modeling simulated thousands of carbon fibers as they emerged from the ink nozzle to find out how to best align them during the process. ‘We developed a numerical code to simulate a non-Newtonian liquid polymer resin with a dispersion of carbon fibers,’ said fluid analyst Yuliya Kanarska. ‘With this code, we can simulate evolution of the fiber orientations in 3D under different printing conditions. The resultant material, the researchers said, could be used to make high-performance airplane wings, satellite components that are insulated on one side or wearables that can draw heat from the body but don't allow it in. The direct ink writing process also makes it possible to print parts with all the carbon fibers going the same direction within the microstructures. 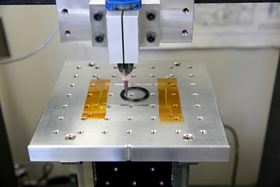 Through this process, the researchers said they're able to use two-thirds less carbon fiber and get the same material properties from the finished part. This story uses material from Lawrence Livermore National Laboratory, with editorial changes made by Materials Today. The views expressed in this article do not necessarily represent those of Elsevier.